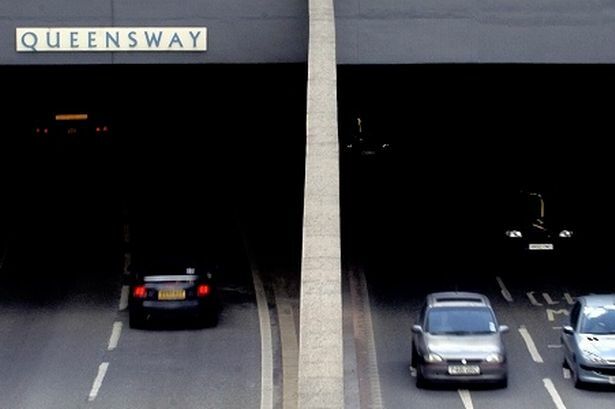 Birmingham’s St Chad’s Tunnel could be filled in and the neighbouring Queensway overhauled in an ambitious £85 million scheme being considered by the council’s transport department. The four-lane tunnel, running under Snow Hill near St Chad’s Cathedral could be raised to a street level dual carriageway, opening up land for development, the Birmingham Post can reveal. The plan will also break the “concrete collar” to the north of the city centre, opening up pedestrian links to the Jewellery and Gun Quarters and creating a new plaza or attractive boulevard. Meanwhile, the Queensway Tunnel, under Paradise Circus, would be refurbished and extended along the weaving section of Great Charles Street Queensway to open up at St Chad’s. Great Charles Street would then also be opened up for development above ground. The plan is the most extensive of three options looked at by transport consultants Atkins in a feasibility study handed to the council last month. Option zero is the low cost scheme to maintain the tunnels in their present form, but with a clean-up and repair work to the ventilation system. But the plan would leave poor concrete in St Chad’s tunnels, which would need heavy maintenance work in future. Option one would link the two tunnels to create a long single tunnel from the end of the Lancaster Circus flyover to Suffolk Street, with an estimated price tag of £64 million. A key risk here would be the knock-on effect of an accident in the tunnel requiring evacuation and diversions. The risks identified for the £85 million option two were cost, the extent of the works, impact during construction and the fact it would mean remodelling St Chad’s junction, which was only created in 2007. The study estimated that construction could take up to five years if traffic is to be allowed and managed through the roadworks, or as little as two years if vehicles are completely excluded from the construction area. The report was commissioned by the outgoing Tory-Lib Dem administration and arrived too late for their cabinet to consider it. But Tory group leader Mike Whitby said his group would support option two as it provided the greater long term benefit for the city centre. The idea was first discussed in the Highbury Initiative in 1988, a summit of council officers and politicians, which first proposed the breaking of the concrete collar. This eventually led to the linking of Centenary Square and Brindleyplace to the city centre and the demolition of Masshouse Circus. This latest report now lies in the in-tray of new Labour council leader Sir Albert Bore, who has been championing the joining of the two tunnels for many years now. The idea was again floated by Labour in 2005 but dismissed by the then Tory cabinet member for transportation Len Gregory who said that a long tunnel would create a congestion nightmare in the event of a rush hour accident – with traffic backed up all the way to the M6.